Concrete typically has a neutral gray color that blends well into most surroundings. Numerous options are available if you would like to change the color of the concrete. 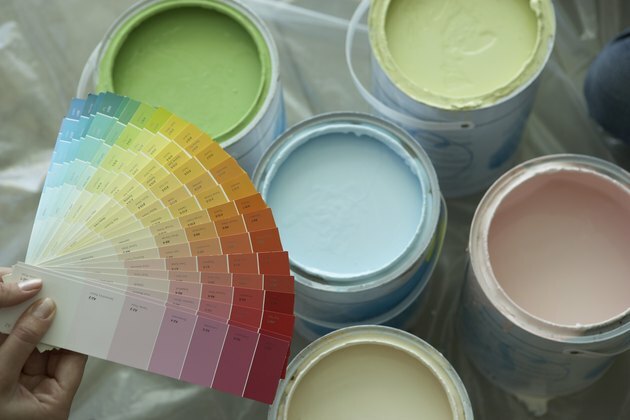 One of the most beneficial tinting options is colored latex paint, which will also make the concrete easier to work with. The pigmentation in the paint will color the concrete while the latex fills in air bubbles, making the mixture sturdier. The adjusted texture is especially desirable in stamped or molded concrete, but it will improve almost any concrete project. The color of the latex paint will dilute in the concrete mixture. Pour the concrete mixture into a large mixing container and three-fourths the amount of water called for in the manufacturer's instructions. Add an amount of latex paint equal to the remaining one-fourth of the water called for in the manufacturer's instructions. The color of the latex paint will dilute down to a light tint in the mixed concrete. Use a shovel or garden hoe to blend the water and paint into the concrete mixture. When the tinted concrete has blended, observe its color and add more paint as needed to darken it, if you prefer. Continue mixing the concrete until no areas of dry mixture remain. Use the tinted concrete immediately and allow it to dry for the time indicated by the manufacturer's instructions. The tinted concrete should not shrink as much as a non-tinted variety and will hold detail from stamping or shaping much easier. Apply a concrete sealant if it will be exposed to weather to prevent it from eroding. Each sealant needs to be applied in a slightly different way, follow the manufacturer's instructions for best results. The sealing process is the same for tinted concrete as non-tinted concrete; there is no need to alter it.